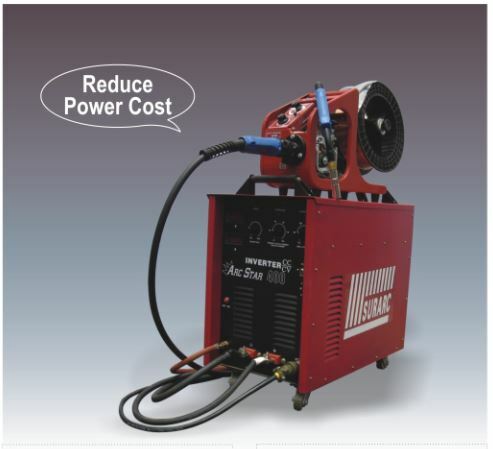 Multisystem MIG/MAG/MMA IGBT Inverter Welder ARCSTAR 400 CC/CV is a high performance welder which can handle both MIG / CO2 & MMA Welding Processes with excellent ARC characteristics. The machine operates at very high power factor & efficiency. Easy change over from MIG to stick electrode welding & vice versa by selector switch. 2 Track /4 Track option for MIG/MAG process i.e. Less fatigue for operation to hold torch switch for long hours. Crater Current/ Crater voltage control for 4 track MIG/MAG Process i.e. Ideal for crater filling. Current / 100% duty cycle 310 Amp. Current 100% duty cycle 310 Amp. Current 60% duty cycle 380 Amp. In view of continuous development, Sur Iron reserves the right to modify/ after the design and/ or specification without any prior notice.